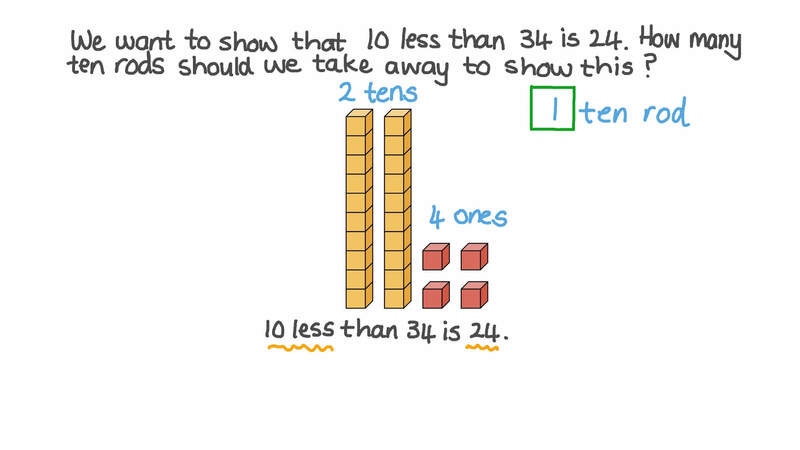 In this lesson, we will learn how to find ten more and ten less than a two-digit number using base ten blocks and place value tables. Find 10 more than 20. Use the base ten blocks to help you. Find the two-digit number and then find 10 more. Now, find 10 more than 26. We can use number bonds to ten to help us find 10 more than any tens number. If we know that 3 + 1 = 4 , we also know that 3 0 + 1 0 = 4 0 . We have just made the numbers bigger by 10. Use number bonds to help you find 10 more than 80. Nabil writes the number 87 on his chart. If he finds 10 less, what will happen in each column? AThe ones will go down by 1. The tens will stay the same. BThe tens will go down by 1. The ones will stay the same. Now, find 10 less than 87. What will the new number be? Find 10 more than 37. Find 10 more than 89: 8 9 + 1 0 = . Find 10 less than 50. Use the base ten blocks to help you. Find the picture that shows 10 less than 38. Fill in the blank: 1 3 + = 2 3 . Fill in the blank: 4 8 − = 3 8 . We want to show that 10 more than 59 is 69. How many more ten rods should we add to the picture? We have just made the numbers 10 times bigger. Use number bonds to help you find 10 more than 60. Farida writes the number 63 on her chart. If she adds 10 more, what will happen in each column? AThe ones will go up by 1. The tens will stay the same. BThe tens will go up by 1. The ones will stay the same. Now, add 10 more to 63. What will the new number be? We want to show that 10 less than 34 is 24. How many ten rods should we take away to show this? 49 is 10 less than . Which number is NOT 10 less than 65? Which number is NOT 10 more than 32? Let’s think about finding 10 less. Now, find 10 less than 37.